The imposed Emergency Manager has requested the city’s water department cut off water indiscriminately to 3000 households each week. No consideration of ability to pay, young children or elderly. 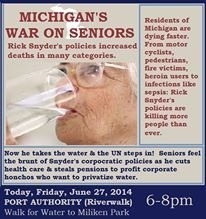 This is what privatized water companies practice in their policies. 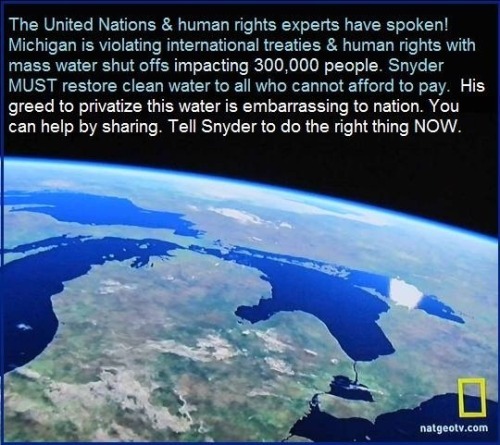 We also hear the EM wants to privatize the water. Note the ties to the State of Michigan proclaiming and doing everything it can to break a city that doesn’t fit it’s PURE MICHIGAN plans. Numerous filings against the bankruptcy claim it was falsified by the state. There is a big picture of human rights injustices. The mainstream will pick and chose how to frame the situations. Big picture is State of Michigan wants to remove Detroit undesirables, transform the city with Chinese venture capital assistance, and move the city farther into industrialization. Pollution in 48217 zip code is the worst in Michigan and surrounding areas can’t be much better. “Disconnection of water services because of failure to pay due to lack of means constitutes a violation of the human right to water and other international human rights,” the experts stated in a news release. 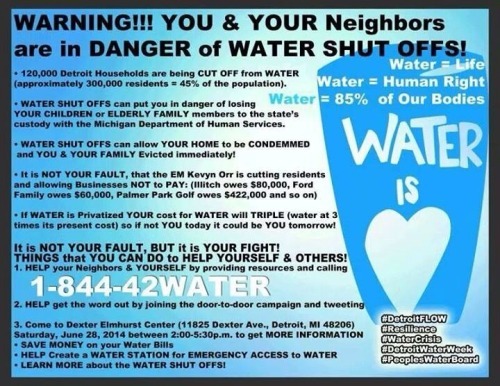 The Detroit Water and Sewerage Department has been disconnecting water services from households which have not paid bills for two months, and has sped up the process since early June, with the number of disconnections rising to around 3,000 customers per week. As a result, some 30,000 households are expected to be disconnected from water services over the next few months. 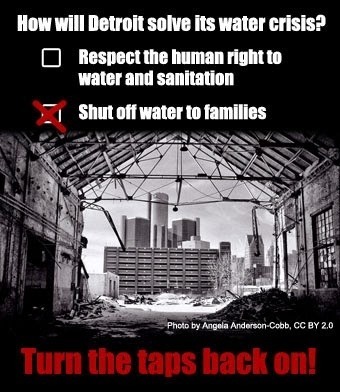 The news release noted that due to high poverty and unemployment rates, relatively expensive water bills in Detroit are unaffordable for a significant portion of the population.